We caught up with Gazelli House Reiki Master Jasmin Harsono to discover what to expect from our new monthly Reiki meditation evening at Gazelli House, our wellbeing space and spa in London’s South Kensington, Brompton Cross - where Chelsea meets Knightsbridge. Reiki is ‘Universal Energy’ – we are connected by energy on a quantum level. As a practitioner, I’ve learnt to be attuned to Reiki and to pass this on to all living things. I’ve never been to a Reiki Meditation before – what can I expect? During the Reiki meditation I create a ‘holding space’ for you to feel relaxed and find peace. Your mind, body and soul will find calm as you are led through a guided meditation and you will fall into a deep theta state (a meditative state where deep healing and transformation take place) through the use of energy, Reiki and sound. At the start of the meditation I will concentrate on helping you to settle and arrive in the space – my aim is to help you to feel safe and supported. You will be guided through gentle breath awareness, which will help you to get into flow with your breathing, deepening your experience and allowing you to open up to receive high vibrational energy as a group and short boosts of energy one on one. Come with an open heart, as we fall deep into the heart centre – home. The monthly meditation at Gazelli House starts at 6.30pm so you’ll have time to make yourself comfortable before the meditation starts at 7pm. The meditation will last for around 40 minutes and afterwards we’ll have time to have tea and to share our experiences. I don’t know how to meditate – does that matter? Not at all. There are many types of meditation and I will guide and support you. The Reiki meditations I lead cater to beginners as well as to the most experienced. What should I wear to the Reiki meditation? If possible, wear comfortable clothes. It’s a good idea to wear layers so you can easily adjust if you are feeling too warm or cold. We will provide blankets and make you feel cosy. Is it OK to come alone to the Reiki meditation? Yes, please do come alone. In my meditations you will feel completely at home and fully supported. How will I feel after the guided meditation? Relaxed and restored. Reiki and sound energy flow where they need to go – we trust in that. Is there anything I can or should do to prepare for the group meditation? Stay well hydrated and arrive on time. Bring along a notepad and pen as often it is nice to write down ideas and thoughts that came to you during the meditation. There will be time to drink tea, share and journal after the meditation. What are the benefits of going to a group meditation? You will be able to relax and rest completely, allowing the mind, body and soul to receive deep healing. Further mental and emotional benefits can include improved sleep patterns, feeling more positive and energised, letting go of suppressed emotions and unhealthy patterns, boosting self-esteem and reducing stress and anxiety. Benefits to the body include improved metabolism and digestion, releasing muscle tension and increasing energy. Meditation has been shown to improve wellbeing for many conditions including respiratory issues, IBS, asthma, ME, headaches, sleeplessness and low energy. Meditation is also good for the soul – it expands inner awareness, creates a deeper self connection and inner wisdom, deepens creative and sensual energies and helps to create a feeling of peace. 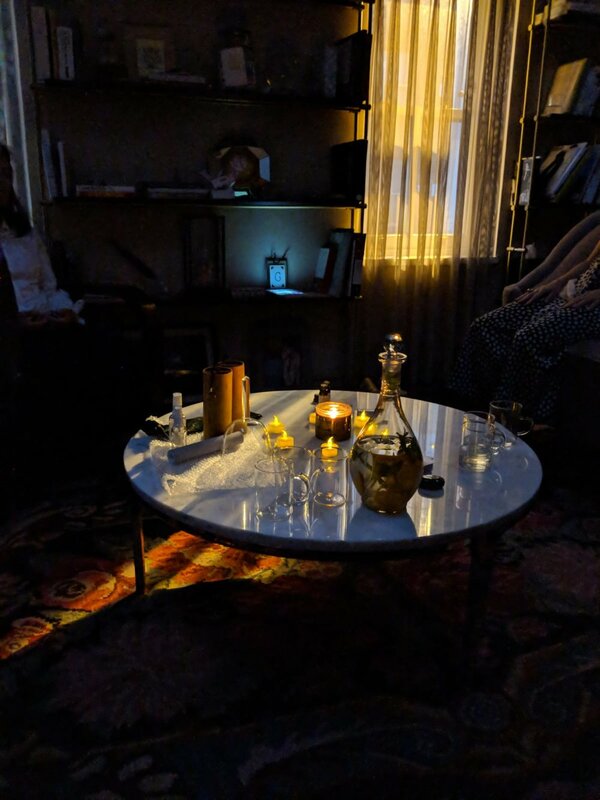 What’s different about this meditation group at Gazelli House? Group meditations are special because as we share the highest energy of Reiki and sound, we will all start to become in tune and flow with this energy, breathing love in and out of our minds and bodies and sharing it with one another. You will go through your own individual experience but feel the support of everyone around you. Gazelli House is tucked away on Chelsea’s Walton Street, close to Knightsbridge, Kings Road and South Kensington. The group Reiki meditation takes place in the Sky Parlour, a homely and inviting space with walls lined with books tucked away at the top of the house. October’s Reiki meditation at Gazelli House South Kensington, London is now fully booked but you can book your place at our next meditations here. If you have any questions, please email our front of house team here, who will be happy to help.